A representative from the South Korean weather service is visiting Tyrol for the Hahnenkamm races to gain experience for meteorological services at a major alpine event, in preparation for the 2018 Olympic Games. ZAMG has provided weather forecasts and meteorological stations for the Streif for over ten years now, and they will be joining the weather team in South Korea for the 2018 Winter Olympics. Forecasts for the Hahnenkamm Weekend promise lots of sunshine and around 0 °C in the finish area. The weather will improve just in time for the Ski World Cup in Kitzbühel, says Manfred Bauer from the Central Institute for Meteorology and Geodynamics (ZAMG): “The weather will lighten on Wednesday and the sun will come out. It should be very sunny from Thursday to Sunday. It will also be milder over the next few days and we expect temperatures in the finish area to be around 0 °C. Fog banks on the mountain slopes remain an element of uncertainty, although the chances of this happening are slim.“ Special forecasts and weather stations along the Streif ZAMG and Kitzbühel Ski Club have been working together since 2004. From the end of December onwards, ZAMG Innsbruck provides the organizers with daily forecasts for the different sections of the course, to enable optimum preparation of the slope. Three additional weather stations were built along the Streif at the end of October for this purpose. During the race preparation phase, they deliver important information on temperature and humidity. During race days, the wind measurements are particularly relevant to guarantee the racer safety during the jumps. These additional weather stations are positioned at the Mausefalle (1,605 metres above sea level, Seidlalm jump (1,258 m) and the Hausbergkante (1,032 m). These are in addition to the permanent ZAMG monitoring sites at Hahnenkamm-Ehrenbachhöhe (1,794m) and Kitzbühel Town (744 m). Preparations for the Olympics: South Korean weather services in Kitzbühel Thanks to its proven competence and extensive experience in providing meteorological services at major events in challenging terrain, ZAMG is also in demand on an international scale and will join the Olympic Games weather forecast team for a fourth time when they travel to South Korea in 2018. 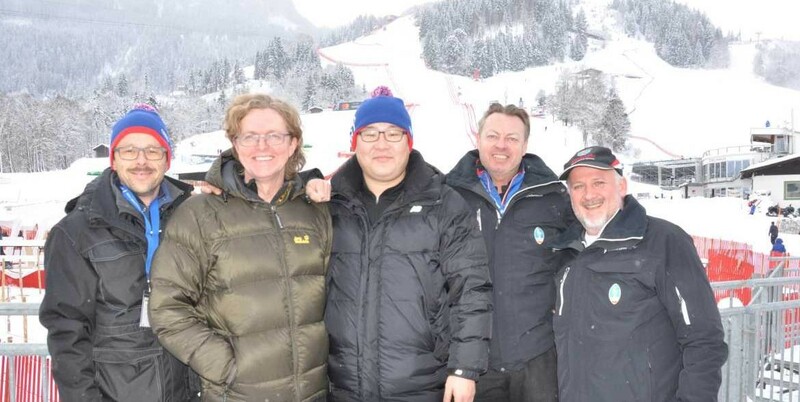 This week, Jinkyu Woo from the South Korean Weather Service is taking advantage of the Hahnenkamm Races to gain experience for the Olympic Games and experience the weather prognosis systems for Kitzbühel in real time. This includes forecasting models and additionally installed monitoring stations, as well as the work of the weather team in the forecasting centre in Innsbruck. ZAMG at the 2018 Olympics in South Korea South Korea operates a state of the art weather service with 27 weather radars, 3,500 precipitation stations and its own research aircraft. ZAMG was commissioned by the South Korean Weather Service to set up a special forecasting model for short-term forecasts in a geographically complex area. The Olympic region around Pyeongchang is located between the peninsular mountain range of up to 1,700 meters above sea level to the west and the Japanese sea to the east. Changing weather conditions, often combined with heavy rain and snow are typical. First tests in the Olympic region In recent months, the "INCA" analysis and forecasting system developed by ZAMG, has been adapted for the specific conditions of South Korea. Test operations are currently up and running in the Olympic region and are being further improved during workshops and training. Weather management of the 2018 Olympic Winter Games is managed by the South Korean Weather Service and supported by the World Meteorological Organization (WMO). The project operates under the title ICE-POP 2018. Weather services from Canada, China, Russia, England as well as from Switzerland and the USA are also involved.